Rail Cargo Group (RCG), an Austrian rail freight logistics company controlled by Rail Cargo Austria AG, intends to expand its services to and from the Port of Trieste (Italy) in 2018. According to the company’s press service, this will improve connections not only between the Mediterranean and the rest of Europe, but also with the Far East. RCG started its transport operations to and from Trieste in 2012. Since that time, the company has become an expert and one of the top suppliers of intermodal and conventional rail logistics services to the port with a market share of about 50%. The volume of its operations there has grown 60% since the launch. And for 2018 RCG is planning a further increase of 20%, above all in the automotive sector. The increased number of trains will link the port via the rail network with new economic regions in Central Europe. The connection to the port of Monfalcone will also be further enhanced. “Together with our partners in Trieste, we will develop additional logistics solutions for the customers. Through use of new multi-system locomotives and new wagon equipment, we will consistently strengthen our position in Trieste and Monfalcone,” says Erik Regter, Member of the Board of the Rail Cargo Group. To ensure a smooth service and high-quality management of transport operations on the rail network, RCG successfully cooperates in Italy with such companies as Alpe Adria S.p.A, T.O. Delta and U.N. Ro-Ro. Located on the Adriatic coast in the northeastern part of Italy, on the crossroads of major shipping routes and the Baltic-Adriatic and Mediterranean corridors, Trieste is a natural hub for overseas countries to trade with the dynamic markets in Central and Eastern Europe. And rail services play a vital role in the port’s logistics. Trieste’s extensive internal rail network (70 km of track) allows all the docks to be served by rail with the possibility of assembling freight trains directly at various terminals and is connected with the national and international network. Over 400 trains a month link Trieste to the manufacturing and industrial areas of North-East Italy and Central Europe, with different destinations, such as Germany, Austria, Hungary, Czech Republic, Slovakia, Switzerland and Luxembourg. The Trieste and Monfalcone Port Authority and its successor, the Port Network Authority of the Eastern Adriatic Sea, that manages the port of Trieste now, have implemented many successful initiatives in recent years, in close consultation with the Friuli-Venezia Giulia regional government. The growth rates of the port are impressive. In 2017, the port of Trieste handled 61.96 mln tons, +4.58% to the 2016 results. The major part of the port’s traffic consists of liquid bulk cargoes (43.75 mln tons, +2,33%). The container traffic in 2017 was 616,156 TEU, which was up 26.66% to the previous year. 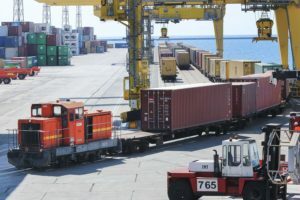 The number of trains serviced by the Trieste Industrial Port and New Free Port last year increased by 13.76%, up to 8,681 units. With modernisation and further expansion of the terminal and the rail infrastructure, the course has been set for further growth in coming years.